My Lord, Please Sanctuary Me: Oh, Fudge! I'd give up chocolate, but I'm no quitter! My husband's all time favorite Christmas movie is A Christmas Story. It must be a guy-thing. I think its only rival is It's a Wonderful Life, which obviously has a much better message. 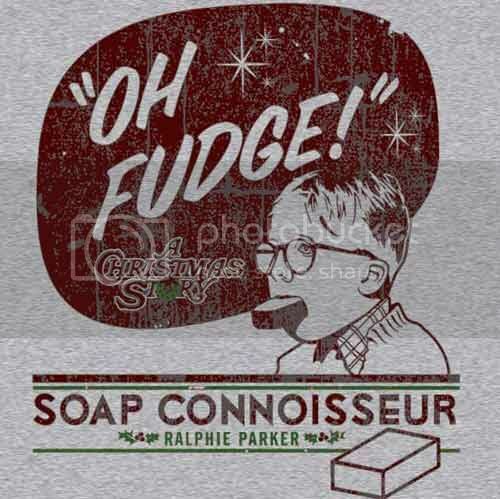 However, my topic today is fudge, the real stuff that melts in your mouth with sweet flavors. There are really easy ways, even foolproof ways, to make creamy fudge in these modern times. I do not use them. No, I am compelled to do it the old fashion way or perhaps I am just entrapped by my illogical need for complexities. Then, the two candy thermometers I have are not that helpful. I calibrate them by boiling water and one reads 4 degrees lower than it should be and the other 10 degrees lower, but that is at the boiling point and I suspect that I cannot rely on that at the higher temperatures so when I think the temperature is close, I still do my soft ball test the old fashion way also. I have to tell you that I rarely have a batch of fudge turn out perfectly the first time and that could be in part because I only make fudge at this time of the year. Fortunately, I found out that by adding a tablespoon or two of milk fudge can be reheated to the soft ball stage again whether it is grainy, not setting, or it seized before it was poured in the pan and then cooled to 110 degrees (for me that is 120) and then beat until it just begins to lose its gloss. Do not hesitate at this point to pour in into a prepared pan, as I tend to do thinking it really has not lost its gloss enough...rolling my eyes! I have been making fudge for over thirty years; you would think I would learn by now. Go ahead and laugh, because when I finally get it, it is soooo right. It makes the process of redoing it worth while. I think God must see us in that way. We can appeared completely ruined, but God has the mastery to take where we are and start the process over again until we are just the way He wanted.... Hmm, I am not so sure we ever reach that point actually, but at least we have the potential to do so.